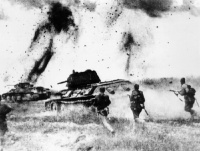 Entre los 1800 carros T-34 suministrados por la URSS a China a primeros de los 50, había un número de T-34-76. Después de que los carros entraran en servicio en el PLA, casi todos ellos fueron enviados a Corea del Norte. Se aumentó la vida útil de esos carros con mejoras de procedencia china, que incluían un nuevo motor y una suspensión modernizada. 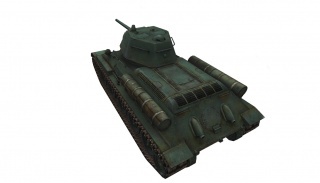 With less research options than its Russian counterpart the T-34, it may not offer any new elements to those who have driven the Russian tank previously, but for new players or players who haven't played the T-34, the Type T-34 will offer a versatile tank with a fast & accurate gun (a copy of the ZiS-4) fit for all roles, be either flanking, sniping and even brawling. Keep in mind that your 45mm armor, despite being well sloped, can still be penetrated often, so you should make up with maneuverability for fast paced tactics instead of a static role, especially when facing artillery fire. 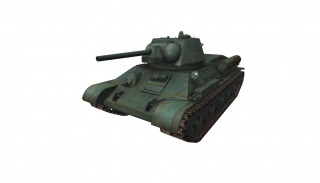 The Type T-34 has very thin armor so it is easily destroyed if found traveling alone. Travel with a group to support allies and do not rush into battle if you want to do well in this tank. The armor is well sloped but it does not actually help as much as one would expect, as the armor is not much thicker than the M5A1 light tank. The turret is very susceptible to damage so try not to let opponents hit the turret. 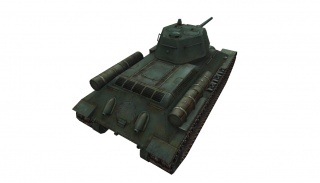 You will generally be up against higher tier tanks which will penetrate your armor like butter, so play this tank safe and use your surroundings so the enemy does not see much of your tank. When you are playing on a map whith many buildings you could drive around your enemys and attack them from the side when they are distracted from your teammates. But you have to be careful, because when someone starts to attack you, you have to retreat fast. The tank has a good top speed but it rarely ever reaches it unless going downhill. It does not have the best maneuverability so do not try circling around enemies. The speed is good enough to weave in and out of cover, so when facing a higher tier enemy, driving forward and back, even without cover, will leave your enemies without a straight shot. Also, the Type t-34 is good at ramming opponents. At top speed, a ram from this tank can be devastating. Even with low speed collisions, the opponent is usually the only one to take any damage. 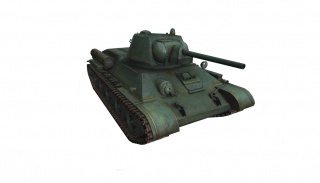 When the Type T-34 is fully upgraded, its gun can tear enemies apart. Its fast rate of fire and decent penetration can easily take out enemies if you hit the right spots. The rate of fire will usually allow you to get two or more shots off in the time it takes the enemy to fire one so use this to your advantage. Expect it to win face-offs against tanks of the same tier armed with derp guns. Its aim time is actually slower than its rate of fire so if you fire right as it is done reloading, your accuracy will decrease by a small amount. The penetration is decent; it can go through a kv1's side armor with ease. It can even penetrate a Löwe's armor if it is fired in the right spots. Its accuracy is not the best, but it can still be used in a sniper role; just don't expect every round to hit the enemy.